So how do you take care of your skin without spending too much money or time? What products are out there that are really "for men?" 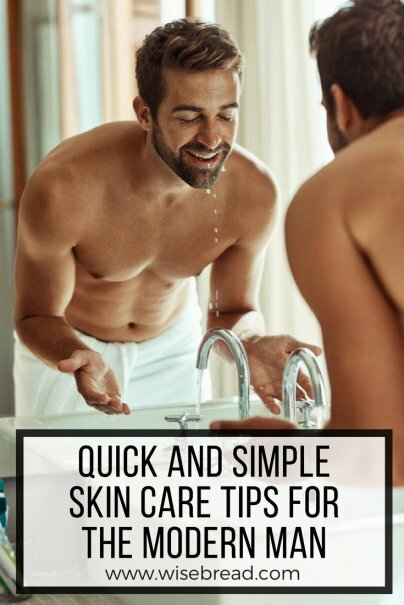 Read on for a guide through the wonderful world of male skin care products. Splash some warm or hot water on your face to open up the pores. Better yet, if you have time put a hot towel on your face for five minutes. It's a great way to relax and open up your breathing passages as well as your pores. Exfoliating is mostly just good for digging all the dirt out of your pores. Once you've done that, you're going to want to wash all that junk away, as well as the dirt that's on the surface of your skin. Get a good lather going all over your face and neck. Scrub for a couple minutes, rubbing in circles, then rinse with cold water. Be sure to be thorough with rinsing, as soap residue can clog your pores as easily as dirt. Using a clean towel, dab the skin dry. Wiping dry can encourage wrinkles and there's no point in drying off your clean skin with a dirty towel. You need an alcohol-free toner to tighten your skin back up. Dab this on your face with a clean paper towel or cotton ball and you'll be good to go. Put some of what you took out of your skin — natural oils and a healthy amount of moisture — back in with a moisturizer. Once you've gone through your routine, take a minute to look at your face. How does your skin look? In just a matter of weeks you'll likely notice that you have clearer, brighter skin and things like enlarged pores and dark circles underneath your eyes will be a thing of the past. I personally like to keep things old school when it comes to my products. Not only does this hearken back to a time when men used products specifically designed for men, it also turns out that it's pretty cheap. There's a lot of cool stuff in the Lucky Tiger Barbershop Classics line. This includes an exfoliant that doesn't rely on abrasive elements for scrubbing, but rather pulls dirt out of your pores. There's also a lemon-scented cleanser that has a lovely, invigorating, and not overbearing scent, as well as two different kinds of post-shave moisturisers. This is a more contemporary line of products that adheres to a more organic and all-natural formula. Personally, I use both, the Barbershop Classics line on days when I exfoliate and the Premium line on all other days. The two things that you need here are the cleanser and the moisturizer. The peppermint lip balm is pretty nice, too. Baxter of California is a little more upscale than the Lucky Tiger Barbershop Classics line, as well as tending toward more "natural" type ingredients. Think of it as a new school take on old school barbershop kit. You can even get their proprietary hot towel shave solution that they use in the West Hollywood barber shop for those days when you really feel like treating yourself. This is the ultimate in "old school." Taylor of Old Bond Street has been selling men's toiletries and skin care products since Queen Victoria's day. This is probably the most expensive stuff on the list, but it's not a bank breaker by any means. Men, what are your favorite skin care products?